The audio amplifier is one I found on eBay from a Chinese manufacturer, with labeling “Kinter 500W”. Price was about $10 including shipping, cheaper than I could build one for myself. I knew what was in the amp from some googling: an LM-series audio amp IC and typical supporting parts, providing a few watts per channel. Not the claimed 500W , but adequate for what I wanted. I run the amp from the PC 12V supply, which is far enough beyond spec for the other stuff in the PC that it’s fine to power the amp with it too. I started with a generic 1/8″ stereo to RCA patch cord about 3ft. 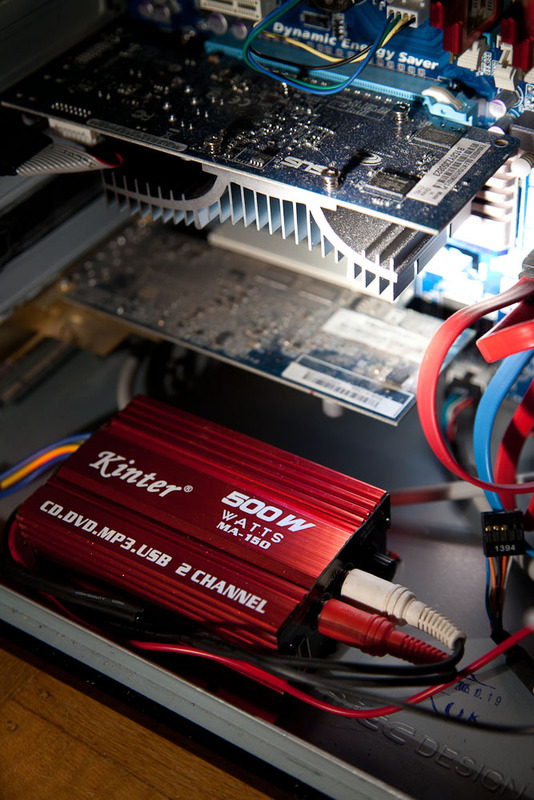 long to connect the amp to the PC audio output. Initially, I could hear several different kinds of noise, some sporadic and dependent on PC user activity and some not. As a first step, I checked for obvious ground loops (google on “ground loop” if you aren’t familiar with that important electrical noise topic), re-routed cables away from hard drives and fans, and replaced the 3ft patch cable that I started with, with the shortest possible shielded cables. That all helped but I could still hear noise in a quiet room. The final thing I did after looking at the amp specs was to put 150 ohm shunt resistors across the high input impedance amp inputs (by splicing them into the patch cable; lazy but good enough for this job) and shielding the resistors with foil. That cut the noise level considerably, to well below what I could hear , and did not affect the frequency response audibly. See the associated picture for what the system looks like. 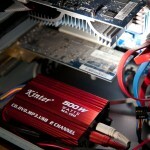 The amplifier assembly is mounted inside the PC, for several practical reasons. Although that isn’t optimal for minimizing noise, it solved some other problems. Hope this helps someone with a similar noise problem. It’s a great and helpful set of information my friend. Thank you for sharing. Thanks. I much prefer silence over noise. We like the useful electric noise post. Hey cool. I was just looking at getting this cheapo Kinter amp for the same purpose. Thanks. Good website and very informative. Thanks for taking the time to write it and post it! You understand a lot about this. Great blog. Useful post. Nice to have a quieter place.